Thutmose II was the son of Thutmose I and a minor wife, Mutnofret. He was, therefore, a lesser son of Thutmose I and chose to marry his fully royal half-sister, Hatshepsut, in order to secure his kingship. While he successfully put down rebellions in Nubia and the Levant and defeated a group of nomadic Bedouins, these campaigns were specifically carried out by the king's Generals, and not by Thutmose II himself. This is often interpreted as evidence that Thutmose II was still a minor at his accession. Thutmose II fathered Neferure with Hatshepsut, but also managed to father a male heir, the famous Thutmose III, by a lesser wife named Iset before his death. Some archaeologists believe that Hatshepsut was the real power behind the throne during Thutmose II's rule because of the similar domestic and foreign policies that were later pursued under her reign and because of her claim that she was her father's intended heir. She is depicted in several raised relief scenes from a Karnak gateway dating to Thutmose II's reign both together with her husband and alone. She later had herself crowned Pharaoh several years into the rule of her husband's young successor Thutmose III; this is confirmed by the fact that "the queen's agents actually replaced the boy king's name in a few places with her own cartouches" on the gateway. 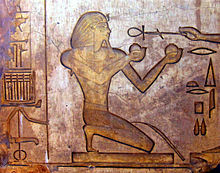 Manetho's Epitome refers to Thutmose II as "Chebron" (a reference to his prenomen, Aakheperenre) and gives him a reign of 13 years, but this figure is highly disputed among scholars. Some Egyptologists prefer to shorten his reign by a full decade to only three years because his highest Year Date is only a Year 1 II Akhet day 8 stela. Manetho's Epitome has been a debated topic among Egyptologists with little consensus given the small number of surviving documents for his reign, but a 13-year reign is preferred by older scholars while newer scholars prefer a shorter 3-4 year reign for this king due to the minimal amount of scarabs and monuments attested under Thutmose II. It is still possible to estimate when Thutmose II's reign would have begun by means of a heliacal rise of Sothis in Amenhotep I's reign, which would give him a reign from 1493 to 1479 BC, although uncertainty about how to interpret the rise also permits a date from 1513 to 1499 BC, and uncertainty about how long Thutmose I ruled could also potentially place his reign several years earlier still. Nonetheless, scholars generally assign him a reign from 1493 or 1492 to 1479. Ineni, who was already aged by the start of Thutmose II's reign, lived through this ruler's entire reign into that of Hatshepsut. In addition, Thutmose II is poorly attested in the monumental record and in the contemporary tomb autobiographies of New Kingdom officials. A clear count of monuments from his rule, which is the principal tool for estimating a king's reign when dated documents are not available, is nearly impossible because Hatshepsut usurped most of his monuments, and Thutmose III in turn reinscribed Thutmose II's name indiscriminately over other monuments. However, apart from several surviving blocks of buildings erected by the king at Semna, Kumma, and Elephantine, Thutmose II's only major monument consists of a limestone gateway at Karnak that once lay at the front of the Fourth Pylon's forecourt. Even this monument was not completed in Thutmose II's reign but in the reign of his son Thutmose III, which hints at "the nearly ephemeral nature of Thutmose II's reign". The gateway was later dismantled and its building blocks incorporated into the foundation of the Third Pylon by Amenhotep III. In 1987, Luc Gabolde published an important study that statistically compared the number of surviving scarabs found under Thutmose I, Thutmose II and Hatshepsut. While monuments can be usurped, scarabs are so small and comparatively insignificant that altering their names would be impractical and without profit; hence, they provide a far better insight into this period. Hatshepsut's reign is believed to have lasted for 21 years and 9 months. Gabolde highlighted, in his analysis, the consistently small number of surviving scarabs known for Thutmose II compared to Thutmose I and Hatshepsut respectively; for instance, Flinders Petrie's older study of scarab seals noted 86 seals for Thutmose I, 19 seals for Thutmose II and 149 seals for Hatshepsut while more recent studies by Jaeger estimate a total of 241 seals for Thutmose I, 463 seals for Hatshepsut and only 65 seals for Thutmose II. Hence, unless there was an abnormally low number of scarabs produced under Thutmose II, this would indicate that the king's reign was rather short-lived. On this basis, Gabolde estimated Thutmose I and II's reigns to be approximately 11 and 3 full years, respectively. Consequently, the reign length of Thutmose II has been a much debated subject among Egyptologists with little consensus given the small number of surviving documents for his reign. Thutmose's reign is still traditionally given as 13 or 14 years. Although Ineni's autobiography can be interpreted to say that Thutmose reigned only a short time, it also calls Thutmose II a "hawk in the nest", indicating that he was perhaps a child when he assumed the throne. Since he lived long enough to father two children—Neferure and Thutmose III—this suggests that he may have had a longer reign of 13 years in order to reach adulthood and start a family. The German Egyptologist, J. Von Beckerath, uses this line of argument to support the case of a 13-year reign for Thutmose II. [page needed] Alan Gardiner noted that at one point, a monument had been identified by Georges Daressy in 1900 that was dated to Thutmose's 18th year, although its precise location has not been identified. This inscription is now usually attributed to Hatshepsut, who certainly did have an 18th year. Von Beckerath observes that a Year 18 date appears in a fragmentary inscription of an Egyptian official and notes that the date likely refers to Hatshepsut's prenomen Maatkare, which had been altered from Aakheperenre Thutmose II, with the reference to the deceased Thutmose II being removed. There is also the curious fact that Hatshepsut celebrated her Sed Jubilee in her Year 16, which von Beckerath believes occurred 30 years after the death of Thutmose I, her father, who was the main source of her claim to power. This would create a gap of 13 to 14 years where Thutmose II's reign would fit in between Hatshepsut and Thutmose I's rule. Von Beckerath additionally stresses that Egyptologists have no conclusive criteria to statistically evaluate the reign length of Thutmose II based on the number of preserved objects from his reign. Catherine Roerig has proposed that tomb KV20, generally believed to have been commissioned by Hatshepsut, was the original tomb of Thutmose II in the Valley of the Kings. If correct, this would be a major project on the part of Thutmose II, which required a construction period of several years and implies a long reign for this king. Secondly, new archaeological work by French Egyptologists at Karnak has produced evidence of a pylon and an opulent festival court of Thutmose II in front of the 4th pylon according to Luc Gabolde. Meanwhile, French Egyptologists at Karnak have also uncovered blocks from a chapel and a barque sanctuary constructed by Thutmose II there. Finally, Zygmunt Wysocki has proposed that the funerary temple of Hatshepsut at Deir el-Bahari was originally begun as Thutmose II's own mortuary temple. Thutmose III here later replaced depictions of Hatshepsut with those by Thutmose II in those parts of the temple that are proposed to have been executed by the latter king before Hatshepsut took over the temple following Thutmose II's death. Thutmose II also contributed to the decoration of the temple of Khnum at Semna. A reconsideration of this new archaeological evidence would remove several arguments usually advanced in support of a short reign: namely the absence of a tomb that can be assigned to Thutmose II, the absence of a funerary temple and the lack of any major works undertaken by this pharaoh. 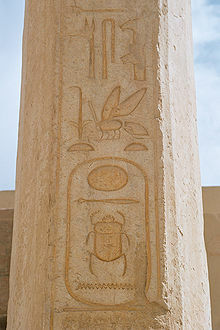 Thutmose II's Karnak building projects would also imply that his reign was closer to 13 years rather than just 3 years. Upon Thutmose's coronation, Kush rebelled, as it had the habit of doing upon the transition of Egyptian kingship. The Nubian state had been completely subjugated by Thutmose I, but some rebels from Khenthennofer rose up, and the Egyptian forces retreated into a fortress built by Thutmose I. On account of his relative youth at the time, Thutmose II dispatched an army into Nubia rather than leading it himself, but he seems to have easily crushed this revolt with the aid of his father's military generals. An account of the campaign is given by the historian Josephus who refers to it as the Ethiopic War. Thutmose also seems to have fought against the Shasu Bedouin in the Sinai, in a campaign mentioned by Ahmose Pen-Nekhbet. Although this campaign has been called a minor raid, there is a fragment recorded by Kurt Sethe that records a campaign in Upper Retenu, or Syria, which appears to have reached as far as a place called Niy where Thutmose I hunted elephants after returning from crossing the Euphrates. This quite possibly indicates that the raid against the Shasu was only fought en route to Syria. Thutmose II is one of the more popular candidates for the Pharaoh of the Exodus. Alfred Edersheim proposes in his Old Testament Bible History that Thutmose II is best qualified to be the pharaoh of Exodus based on the fact that he had a brief, prosperous reign and then a sudden collapse with no son to succeed him. His widow Hatshepsut then became first Regent (for Thutmose III) then Pharaoh in her own right. Edersheim states that Thutmose II is the only Pharaoh's mummy to display cysts, possible evidence of plagues that spread through the Egyptian and Hittite Empires at that time. ^ Betsy Bryan (2000). "The 18th Dynasty before the Amarna Period". The Oxford History of Ancient Egypt. Oxford University Press. p. 236. ^ J. Von Beckerath (1997). Chronologie des Pharaonischen Ägypten, Münchner Ägyptologische Studien 46. Mainz: Philip von Zabern. p. 201. ^ Shaw, Ian; Nicholson, Paul (1995). The Dictionary of Ancient Egypt. The British Museum Press. p. 289. ^ a b Breasted, James Henry (1906). Ancient Records of Egypt, Vol. II. University of Chicago Press. p. 47. ^ Grimal, Nicolas. A History of Ancient Egypt. Librairie Arthéme Fayard, 1988. p. 216. ^ Gabolde, Luc (1987). "La Chronologie du règne de Thoutmosis II, ses conséquences sur la datation des momies royales et leurs répercutions sur l'histoire du développement de la Vallée des Rois". Studien zur Altägyptischen Kultur. 14: 61–87. ^ Gabolde, Luc (1987). "La Chronologie du règne de Thoutmosis II, ses conséquences sur la datation des momies royales et leurs répercutions sur l'histoire du développement de la Vallée des Rois". Studien zur Altägyptischen Kultur. 14: 67–68. ^ Luc Gabolde, "La 'cour de fetes' de Thoutmosis II à Karnak", Cahiers de Karnak 9 (1993), pp. 1–100; Luc Gabolde, "Monuments décorés en bas relief aux noms de Thoutmosis II et Hatshepsout à Karnak", Mémoires publiés par les membres de l'Institut Français d'Archéology Orientale (MIFAO) 123 le Cairo 2005. ^ Luc Gabolde, "Monuments décorés en bas relief aux noms de Thoutmosis II et Hatshepsout à Karnak, Mémoires publiés par les membres de l'Institut Français d'Archéology Orientale (MIFAO) 123 le Cairo 2005. ^ Smith, G Elliot. The Royal Mummies, pp. 28–29. Duckworth, 2000 (reprint). ^ Maspero, Gaston. History Of Egypt, Chaldaea, Syria, Babylonia, and Assyria, Volume 4 (of 12) Project Gutenberg EBook, Release Date: December 16, 2005. EBook #17324.